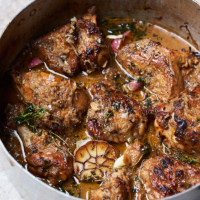 "This dish is very similar in principle to a classic Coq au Vin, but instead of using a robust red wine I have opted for a more modern approach and used orange wine instead. And in place of the smoky body from the bacon we’re getting sweetness from the shallots. Orange wine is pretty trendy at the moment and is increasingly available in good wine shops and really worth investigating. It creates a more complex sauce, with rusty, sherry-like undertones, and the brandy injects extra life in the dish." 1. Preheat the oven to 180˚C/160˚C fan/gas mark 4. Heat a good lug of the oil or clarified butter in a large heavy-based, lidded casserole. Season the chicken pieces with the salt and pepper and brown them in 2 batches. Cook for 4 minutes on each side and set aside. Add some more oil to the pan, and place the garlic bulb halves face down for a few minutes until they begin to caramelise. Next, throw in the shallots and cook in the chicken juices for 30 minutes. Scrape the bottom of the pan to remove all the delicious chicken residue. Add the tomato purée and flour and cook for a few minutes. 2. Return the chicken pieces to the pan. Now you need to flambé! The easiest way to do this is to put half the brandy into a metal ladle, and the rest into the casserole. Set the brandy in the ladle alight and pour it over the chicken. Allow the flame to die down. Next, pour in the wine and the stock, then add the bay leaves and thyme sprigs. Season well with salt and pepper. Put the lid on the casserole and place in the oven for 1 hour. 3. Once the cooking time is up, remove from the oven and stir in the sugar and vinegar. This might sound a bit unusual, but trust me, it really elevates the flavours of the stew. Serve with mashed potatoes and greens. Please note: Third party recipes have not been nutritionally tested by Waitrose nutritionists.